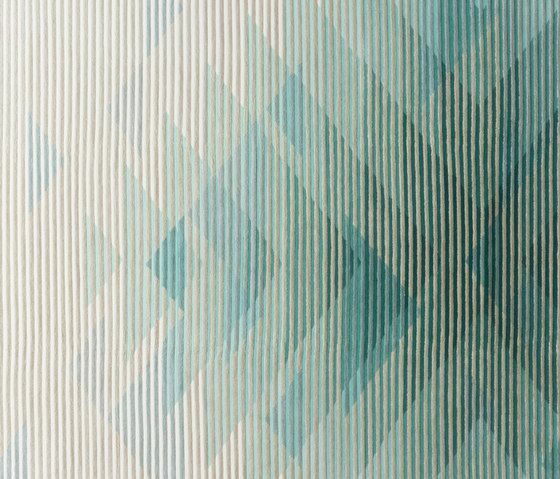 The collection, conceived as second reading of the persian rug, takes its inspiration from the lenticular Israeli artist Yaacov Agam who, together with Victor Vasarely, revolutionised the world of optic perception in art. An iridescent collection, capable of moving from the vivid colours of daytime to the less bright shades of the evening, just like the mirror of water of a lake, “agam” in Hebrew, changes its reflection. As the designers explain: “Imagine a rug that looks very vivid and colourful when you leave home, but the very same rug will appear more relaxing and calming when coming back from work. It is like having two approaches for one thing, two different ways to look at it but then when standing at the right place, you could actually see the whole picture. This may sound like illusion confusion but it is all based on existing op-art lenticular technique that thanks to Golran, and their craftsmen in Nepal, has been translated into marvellous rug making. The graphic of the first series is based on traditional kilim, but here in varying heights of pile technique”.